March 9, 2009. A few months ago, I wrote about a new piece of exploitainment on A&E called Psychic Kids: Children of the Paranormal. The kids were being vetted by Dr. Lisa J. Miller, associate professor of psychology and education at Teachers College, Columbia University, and Chip Coffey, who bills himself as a psychic and a medium. Coffey's greatest claim to fame is that he appeared in another A&E paranormal pandering effort called Paranormal State, which features the ghostbusting investigations of some critical thinking-challenged college students from Penn State University. One of the children featured on the program was Dalton Kropp. I urge you to look at his website. This kid is slick. [update Jan 3, 2015: the website is gone, but there is now a Dalton Kropp Fanclub website.] (Then check out the website of this Australian mother and daughter team. That website, too, is gone, but the mother, Jodiann Poynten, self-published a book featuring her daughter, Emily, as an eight-year-old psychic. Well, the kid hears voices and the mother interprets this to mean the child is getting messages from the dead. The book is called Emily & the Magic Wish: The Journey Begins. Good luck in finding a copy.) That Dalton could dupe Coffey is not a great feat, but many people might think that it would be difficult to dupe Dr. Miller, who has a B.A. from Yale and a Ph.D. from the University of Pennsylvania. She lists as her first scholarly interest "religion & spirituality." If that's not a red flag, it's at least an acceptable segue into the next paragraph. drive the objector into the position of being forced either to admit the phenomena as inexplicable, at least by him, or to accuse the investigators either of lying or cheating or of a blindness or forgetfulness incompatible with any intellectual condition except absolute idiocy. SPR’s first scientific study would have Sidgwick eating those words. The scene has been repeated many times: brilliant scientists who think they can't be duped are not only duped, they are duped by children. Barrett led SPR’s first study (1882-1888). It involved a clergyman’s four teenage daughters and a servant girl. They claimed they could communicate telepathically. Barrett introduced a method for testing telepathy that was popular for more than a century, though it is rarely used anymore by scientific investigators: card guessing. He did a number of guessing experiments (of cards or names of persons or household objects) with the girls and came away declaring that the odds of their being able to guess correctly in one experiment “were over a million to one.” The odds of their guessing correctly five cards in row were “over 142 million to one” and guessing correctly eight consecutive names in a row were “incalculably greater” (Christopher 1970: 10). More men of integrity with high degrees were brought in to witness the telepathic powers of the Creery girls and Jane Dean, their servant. All the scientists agreed that there was no trickery involved. How did they know? They had looked very carefully for signs of it and couldn’t find any! A skeptic might ask: What are the odds that children can fool some very intelligent scientists for six years? The answer is: 100%. Almost immediately the scientists were criticized for being taken in by tricks amateurs could perform. It took six years for these rather intelligent men of the SPR to catch the girls cheating—using a verbal code—and discover their trickery. But that’s not all. While one group of scientists was validating the Creery group, another from SPR was validating the amazing telepathic feats of a 19-year-old entertainer named George A. Smith and his partner in deception, Douglas Blackburn. Smith eventually became secretary of the SPR (Christopher 1970). Had Blackburn not eventually published a series of articles explaining how they fooled the scientists, the world might never have known the details of the trickery (Gardner 1992). The early scientific studies demonstrate the naïveté of the experimenters and the need for experts to help them set up protocols to prevent cheating: experts in non-verbal communication and deception, namely, conjurors, gamblers, or psychologists with expertise in the field of deception. It took some time to sink in, but eventually the experimenters realized that for some reason human beings like to deceive each other. They use all kinds of non-verbal signals to communicate, which can give the appearance of psychic transmission of information. They use glances (up, down, right, left for the four suits of a deck of cards, for example), coughs, sighs, yawns, and noises with their shoes. Other cheaters use Morse code with coins and various other tricks known to conjurers. Sometimes gestures to various parts of the body have a prearranged meaning. Creery-girl and Smith-Blackburn stories are frequent in the literature on psi research. One of the more famous cases is rather recent: the Project Alpha fiasco. From 1979 to 1983, physics professor Peter Phillips did experiments on psychokinesis (mental spoon bending) at Washington University in St. Louis. However, he was the victim of a hoax, code-named Project Alpha. The hoax involved James Randi, Steve Shaw (a.k.a. Banachek), and Mike Edwards. 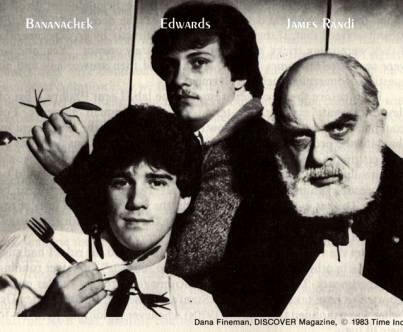 Randi trained two young mentalists/magicians—Banachek was 18 and Edwards 17 when the project began—to fake psychic powers while being investigated in a serious scientific setting. Randi trained Banachek and Edwards so well that out of 300 applicants they alone were selected as subjects. They were able to fool the scientists for four years through more than 160 hours of experiments on their paranormal powers. Though I had specifically warned Phillips against allowing more than one test object (spoon or key, for example) to be placed before a subject during tests, the lab table was habitually littered with objects. The specimens were not permanently marked, but instead bore paper tags attached with string loops. Banachek and Edwards found it easy to switch tags after the objects had been accurately measured, thus producing the illusion that an object handled in the most casual fashion had undergone a deformation (Randi: 1983a). Phillips and his lab assistants became convinced the boys had psychic powers. In 1981, they took a videotape of the Banacheck/Edwards sessions to a convention of the American Parapsychological Association. Their colleagues at the convention are said to have laughed at the video and noted numerous weak spots in their protocols. If Project Alpha resulted in Parapsychologists (real parapsychologists!) awakening to the fact that they are able to be deceived, either by subjects or themselves, as a result of their convictions and their lack of expertise in the arts of deception, then it has served its purpose. Those who fell into the trap invited that fate; those who pulled back from the brink deserve our applause (Randi: 1983b). Christopher relates several poltergeist investigations that turned out to be the work of bored or agitated adolescents and adults. One group of four youngsters was asked why they had terrorized a teacher and the children attending their rural schoolhouse in North Dakota. "They admitted that when they had found their teacher and their parents so gullible, so easy to mystify, they thoroughly enjoyed the excitement and the publicity their pranks had provoked" (Christopher 1970: 149). In 1958, when Christopher offered to investigate the so-called "Seaford poltergeist," the father (James Hermann) in the house where bottles seemed to be popping spontaneously said he would not allow "charlatans, mystics, mediums, or magicians" in his home. Christopher was a magician. In fact, at the time he was the president of the Society of American Magicians. The Hermanns had a 12-year-old boy and a 13-year-old girl at the time. Since he would not be allowed in the house to investigate, Christopher invited the press to his own house where he did six demonstrations that duplicated what was going on in the Hermann household. J. G. Pratt, a paranormal investigator who was allowed in the Hermanns' home, also visited Christopher at his home. While there, "a china figurine leapt from a bookcase shelf and landed some eight feet away." Pratt knew it was magic, but he couldn't figure out the trick. For those interested in more details, I suggest you read Christopher's delightful and enlightening book ESP, Seers & Psychics: what the occult really is. He notes that some items that people think move on their own are actually thrown. People often think they see what they did not actually see. And we are ill-equipped to locate the precise direction of a sound (because of the design of our outer ear, see New Scientist, "Animal superpowers," 24/31 December 2005). In 1984, Tina Resch was 14 years old and living in Columbus, Ohio. Newspaper reports testified to her chaotic household where telephones would spontaneously fly, lamps would swing and fall, all accompanied by loud noises. James Randi studied the case and concluded that Tina was hoaxing her adoptive parents and using the media attention to assist her quest to find her biological parents. A video camera from a visiting TV crew that was inadvertently left running, recorded Tina cheating by surreptitiously pulling over a lamp while unobserved. The other occurrences were shown to be inventions of the press or highly exaggerated descriptions of quite explainable events. (Randi 1995). Resch was validated by several investigators, but instead of going on to a life of telekinetic showmanship, she and her boyfriend ended up in prison in 1992 after the death of her 3-year-old daughter. Returning to Dalton Kropp, the child psychic featured on A&E. I'm not saying he learned his craft by watching Larry King or Montel Williams, or shows like "Crossing Over" or "Medium." I'm not saying he learned his trade by reading Internet sites or books on cold reading. Nor am I saying that he's a trickster. If he is, then his father, a carpenter, seems to be in on the game, unless a correspondent who spent an evening with the two is putting me on. I received an e-mail from someone who, with a friend, spent some time with the Kropps and found them to be "the real deal." My correspondent started her first e-mail to me with: "This is not meant for publication, but I need to dispel your doubts about Dalton Kropp and his family. I do not know about the wife but the father (Larry) and Dalton are the real deal." I have no idea why she thought it important to dispel me in particular about Dalton. Perhaps she knew I would write about it despite her disclaimer, thereby giving up some free publicity to the kid. Anyway, she goes through a laundry list of items that Dalton and his father told her about herself and her friend. Of course, these were things they already knew about themselves, but it impressed her. She concluded by saying she is a great skeptic, these guys knew nothing about us, yet everything they said was true. The icing on the cake, I guess, was to let me know that Dalton had been checked out "by the people at Columbia University who specialize in that area and they judged him authentic also." I guess my correspondent hadn't read my little piece on "Crazy Therapies and Psychic Kids," where I write "no one in his right mind should trust Columbia professor Dr. Lisa J. Miller" when it comes to investigating psychics. It was suggested that I arrange a meeting with Dalton and his family. Fat chance. I live in California and the Kropps live in Illinois. Anyway, I'd be very surprised if they'd let me in the house. My sixth sense (i.e., crap detector) tells me that the Kropps are like the McCleods and that Dalton has been prepped to be another Adam Dreamhealer. Adam claims that things used to fly out of his hands, but now he channels that energy into healing people's cancers and other ailments. In 2006, ABC News estimated that Adam would make more than $1 million that year, not including the income from his books, DVDs, and $150 healing sessions he offers over the Internet. Maybe if I ask nicely I can become Dalton's agent. I am sure you were not aware of the fact this boy has devoted time to missing persons, most recently one that had him up at 5 am every morning to walk and search through woods, fields, marshes, some very harsh terrain, walking up to 11 miles a day, getting home at 1:00 am only to be back up at 5:00am and start again. This trip cost him and myself about 1,000 dollars. He requested nothing in the line of payment. This is a 16-year-old boy. You find me one with that kind of heart and devotion. The boy would be so exhausted, he would fall asleep while eating lunch. So, I guess you don't know all you thought you did. Sounds like a dedicated kid, but I don't see what this has to do with his alleged psychic abilities. Christopher, Milbourne. 1970. ESP, Seers & Psychics. Thomas Y. Crowell Co.
Gardner, Martin. 1992. On the Wild Side (Amherst, N.Y.: Prometheus Books,. Randi, James. 1985. The Columbus poltergeist case. Skeptical Inquirer 9(3) (spring), 221–235. Randi, James. 1983a. “The Project Alpha Experiment: Part one: The First Two Years,” Skeptical Inquirer. Summer. Randi, James. 1983b. “The Project Alpha Experiment: Part two: Beyond the Laboratory,” Skeptical Inquirer. Fall.